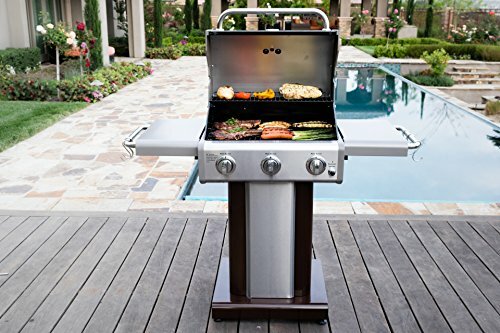 A sleek and compact gas grill is very appealing for people with a small outdoor entertaining space, yet also want to be able to catch the eye of their guests. Unfortunately, some grill manufacturers fall short on filling this niche need. Kenmore might not be the first name you think of when you think about gas grills. 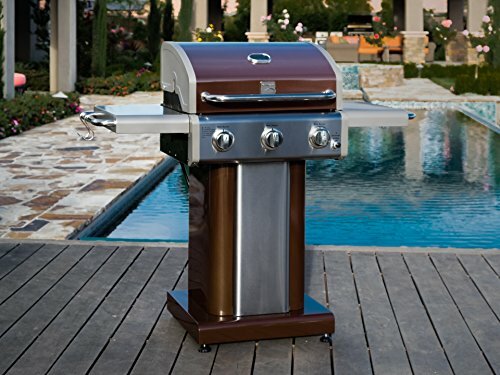 Yet they put their best foot forward with their PG-4030400L 3 Burner Pedestal Grill. It mixed a small footprint, with all the basic things you want in a quality gas grill, and sleek visual appeal. All at a very affordable price, that comes in below most other market contenders. It has three independently controlled burner elements. Each produces a nice, hot 10,000 BTUs for a grand total of 30,000 BTUs. This is more than enough heat to sear a steak on high flame, yet it can also be dialed down to handle slow-and-low heat applications. Kenmore also realizes that natural gas is becoming increasingly popular and available in more-and-more homes. They also designed this grill to be converted to natural gas by installing an affordable conversion kit. There is a built-in electric igniter system to fire up all three gas elements. Kenmore even goes so far as to include the AA battery, to spare you that annoying drive to the store. The grill grates are made from heavy duty cast iron that has been treated with a special porcelain coating. This gives them non-stick properties, while also being able to retain heat for a superior steakhouse sear. The exterior is a blend of stainless steel, powder-coated steel, and a visually fetching mocha glaze. They also made sure to include tool and towel hooks on the side shelves. The side shelves can also fold down to reduce its physical presence when not in use. 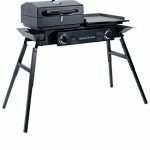 The base has two casters that are easy to move, as well as two feet which can be easily adjusted to ensure the grill remains level. 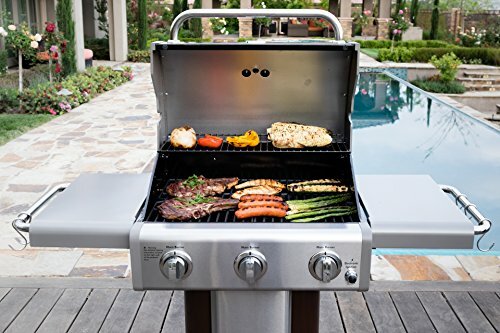 Kenmore makes a real effort to infuse quality into every element of this grill, while also not turning it into a heavy behemoth on your deck or patio. For this friendly price point, the porcelain coated cast iron grill are a nice touch, and the exterior appeal will certainly get it noticed. When it comes to assembly, the instructions are a little hard to read at times, and you will need to give yourself a little bit of extra time to put it all together. That being said, you should still be able to assemble it in around two hours. If you simply aren’t mechanically inclined, there are some online retailers who offer an expert assembly service for a reasonable price. 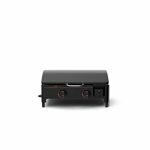 The Kenmore 3 Burner Pedestal Gas Grill is a little on the small side. 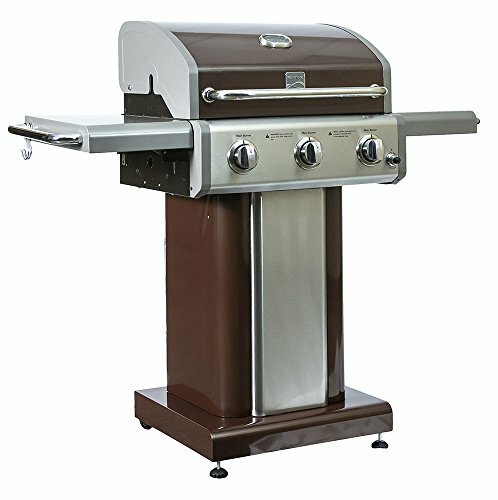 Still, it’s 408 square inch primary grill grate gives you enough grilling space to prepare a meal for a family of four. If you dial in the three burners just right, you can create two different heat zones. One can be set low to cook things that take a while like bone-in cuts of chicken. Then the other heat zone can be set high to sear off burger patties or mark the chicken skin when it’s done. The porcelain coating on the cast iron grill grates is a nice touch, and you would have a hard time finding more than one or perhaps two other grills in this price point that have them. Most other competitors have sticky stainless steel or chrome plated grill grates. 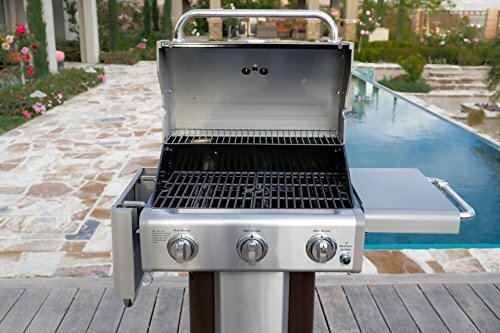 The primary grill grates measure in at 408 square inches. The warming rack is 144 square inches. 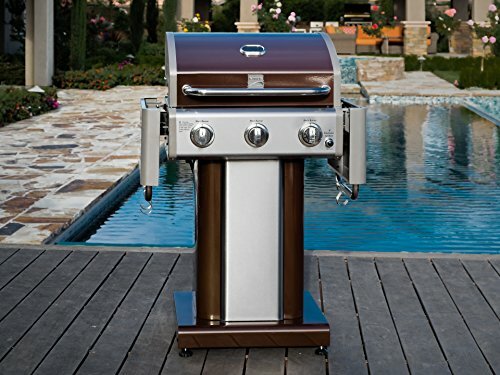 Combined the Kenmore 3 Burner Pedestal Gas Grill provides you with 522 square inches. This is enough to prepare a Tuesday night supper for a family of four, or grill brats for the guys at your fantasy football draft. While it doesn’t come with it, Kenmore made a point to recognize the growing popularity and increased the availability of natural gas. If you have a municipal hookup available on your deck or patio, the affordable conversion kit will only take around half an hour to install. 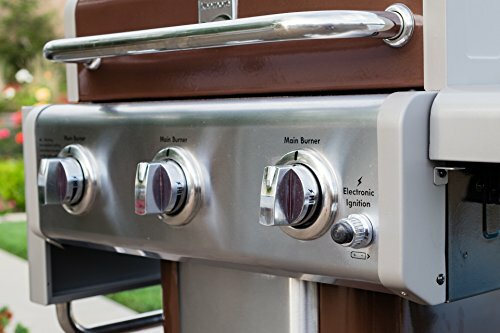 As a gas grill, the Kenmore 3 Burner Pedestal Gas Grill is easier to clean than a traditional charcoal grill. Just bear in mind that there isn’t much in the way of a drip pan. Lining the bottom of the firebox with some heavy duty aluminum foil will help with clean up later. The porcelain coating on the cast iron grill grates also reduces the chances of food sticking. You can give it a quick scrape down with a grill brush to clean away any lingering debris. If there’s something like a little caramelized marinade stuck in a corner or in between the rungs of a grate, you can simply remove it and soak in warm, soapy water. The special coating will prevent the water from rusting the underlying cast iron. 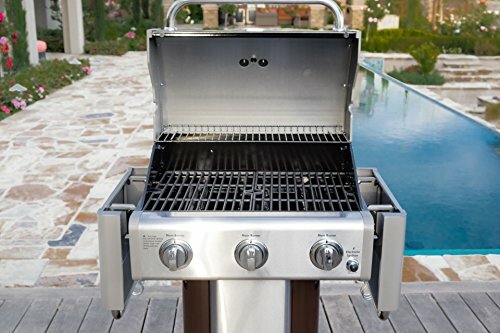 The Kenmore 3 Burner Pedestal Gas Grill comes with a 1 Year Limited warranty, 5 years on the stainless steel burner. 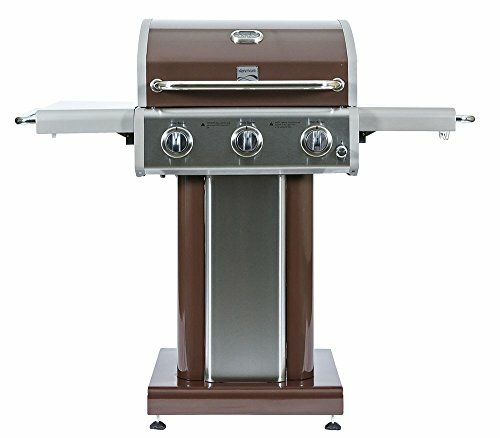 This is pretty much on par, or even half a step better than most competitors offers for an entry-level priced gas grill. There are online retailers who also offer an affordable protection plan. 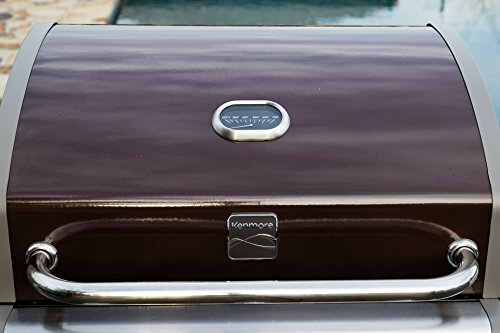 Kenmore might not be the name you think of first when you are shopping for a new gas grill. Still, it’s hard to look past the visual appeal, quality materials, and the compact footprint. Especially considering its very friendly price. 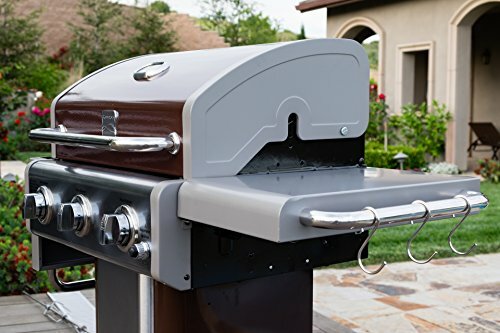 If you space on your deck or patio is limited, the Kenmore 3 Burner Pedestal Gas Grill needs to be near the top of your list!